Most home improvement industry statistics show that for a traditional 40 gallon water tank, the average lifespan of a water heater is about 8-12 years. However, you may be surprised to learn that there are many factors involved in the actual lifespan of your water heater. Quality of Your Water — Water in the holding tank generally causes corrosion over time, but pH levels, chlorine content, sediment, minerals and impurities are factors that can increase your water heater’s rate of deteriorations. Water Pressure – High water pressure to your home is no different than high blood pressure in your body. Safety Code says 80 psi is the maximum allowed before a PRV-pressure reducing valve should be installed. Check your water pressure. Location of the Water Heater – A water heater located inside the home where temperatures do not fluctuate generally will last longer than one located in a garage, attic, or utility room. Maintenance Schedule – Water heaters require regular maintenance to ensure their longevity. Are you following the water heater maintenance schedule recommended by the manufacturer? Quality of Your Water Heater – Just like everything else you purchase, there are different qualities and prices of water heaters. Some models have thicker linings and larger anode rods which last longer. 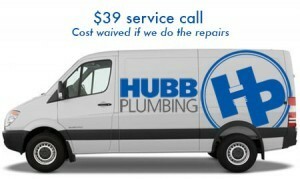 Call Hubb – your qualified water heater contractor. We can be your best friend when it comes time to maintain your water heater, especially if it requires draining, flushing, or any type of maintenance. Be sure to contact us!